Five minutes walking south from the station brings you to the most interesting piece of natural history in Bricket Wood. 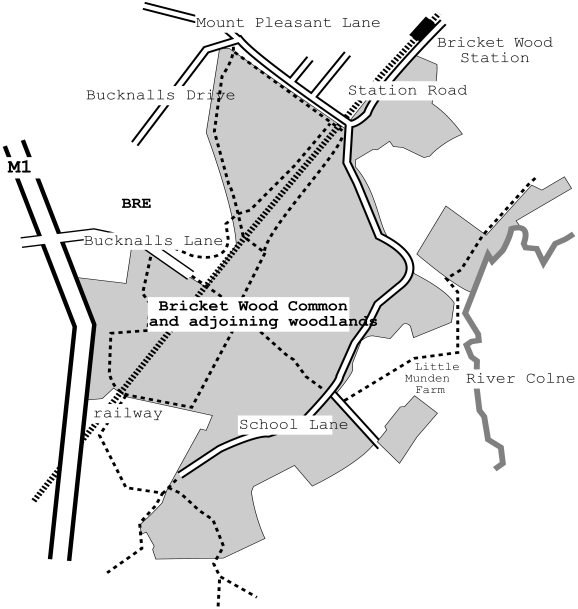 The Common is a large 70 hectare open access space between School Lane, Mount Pleasant Lane and Bucknalls Drive, where quiet recreation and nature conservation go hand in hand. This place is unusual. 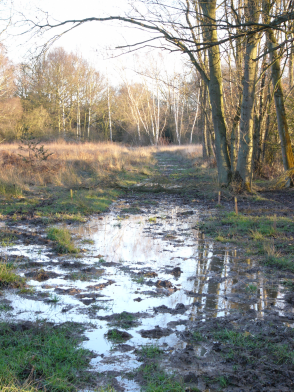 Although you are only a couple of miles from Watford it feels like you are out in the wilds, and in ecological terms these kind of habitats have all but disappeared from the south east. Historically, this whole area was predominantly covered in ancient woodland with a few scattered farms and homesteads; just look at the name of the settlements around here. The Common was probably cleared long ago but it was poor land for agricultural purposes and was probably too wet to build on. So it remained as a common resource where villagers from the nearby hamlets of Old Bricket Wood and Smug Oak would graze their animals and harvest some wood for fuel and building purposes. Now it still remains a resource for local people to use, but our needs have changed over the years. In the modern context it's become an exceptional place to walk for quiet relaxation and to make contact with nature. There's a real mixture of habitats for wildlife, lowland heath, ponds, grassy rides and ancient woods which in springtime are covered with bluebells. With luck, you might find newts, orchids, heathers, rare dragonflies, butterflies and the occasional glimpse of a muntjak deer. A part of the Munden Estate, the Common is now managed by the Joint Commons Committee with a partnership of conservation organisations and local people. As a large and rare remnant of lowland heath, the Common is protected and recognised nationally as a Site of Special Scientific Interest.